With so many small VR “experiences” and gallery shooters coming out for all VR platforms, it’s hard at times to ween out the good from the bad. Smashbox Arena, developed by BixBox VR, falls somewhere in the grey area many people aren’t willing to explore. The game has a lot of good things going for it, but unfortunately in this case the cons within it outweighs the pros. Smashbox Arena has an amazing concept. 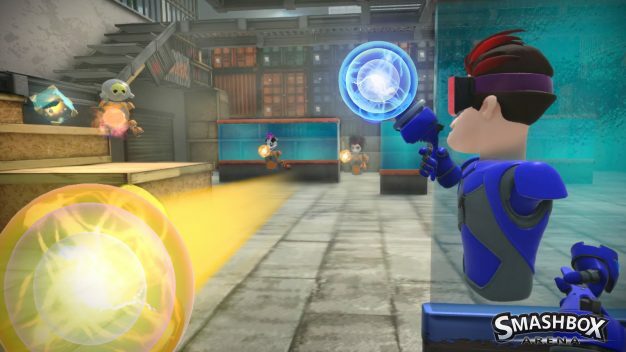 It’s essentially VR dodgeball. They accomplish this by having a 3v3 setting where every person has a gun. By people I mean AI since nobody plays this game, but more on this later. 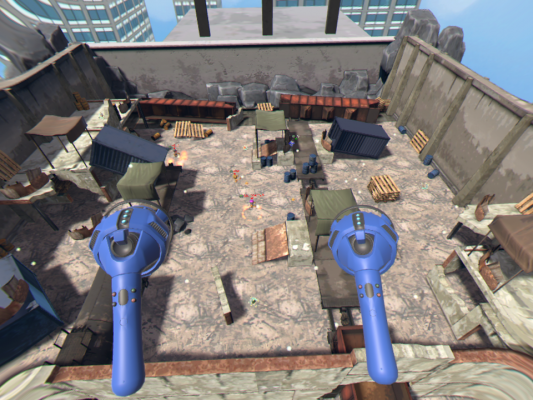 Each player is equipped with a “gun” that allows them to pickup a dodgeball that is randomly spawned on the map and allows them to shoot the balls at their opponent. When attacked by someone, you can catch the ball mid-air and attempt to shoot it back. You can also block incoming attacks if you’re holding a dodgeball yourself. All in all it makes for a fun experience, if you can get past the fact that the “Story Mode” id just about 5 matches of playing the game with AI. 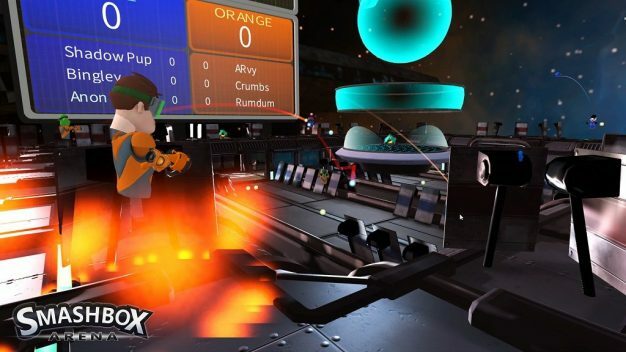 The Story Mode within Smashbox Arena is one of the biggest jokes in any VR game. When you think of a “Story Mode” within a video game you tend to lean towards thinking of there being an actual story. Sorry to disappoint, but this game has absolutely ZERO story. When you select Story Mode in the main menu it then asks which difficulty you’d like to play it at. Regardless of difficulty the game seems to play the same exact way. Regardless it places you in what seems to be a test match agains another team with 3 AI against yourself and 2 AI. This mode is not fun at all. I completed the entire thing, 5 matches, on easy in about 15 minutes. aside from the trophies, there seems to be no reason to go back. 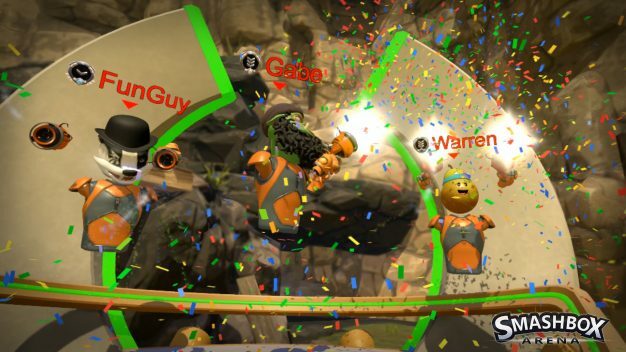 The multiplayer is one of the most interesting, and only other, portions of Smashbox Arena. This is what is expected when reading the description of the game. Two game modes seems to be the main way most of these smaller VR games tend to go. The multiplayer was non-existent. Sure you can boot up the game and get into a lobby. However, finding even one other person to play with tends to be the real issue. Unfortunately for both the potential players and the developers, this game is dead. Not a single person was online and able to join a game other than myself. The lack of population online aside, Smashbox Arena has one really cool aspect going for it. When you are eliminated for the given round, you can still see what everyone is doing on the map in real time. Not only this, but it essentially makes you a giant above the map and you have the ability to see what everyone is doing and can move the map around as you see fit. The few maps this game has were also pretty cool. They all had almost a paintball arena vibe and were a good size for the small 3v3 games that are had on them. In the end I don’t think Smashbox Arena warrants whatever price point it is currently at. Even at $1, the game itself is completely pointless unless you’re out to get some easy trophies. If this game still had a healthy multiplayer population this may have been a completely different review, but it doesn’t; the most important component of dodgeball is having other players to dodge the balls.